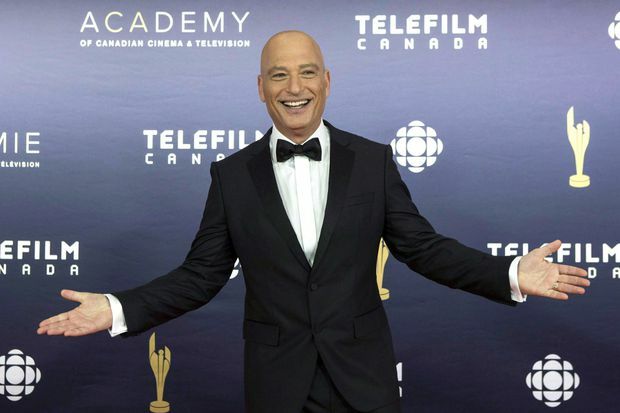 Howie Mandel arrives on the red carpet at the 2017 Canadian Screen Awards in Toronto on Sunday, March 12, 2017. Montreal’s Just For Laughs answered doubts about its future Wednesday with the company’s sale to an investor group led by Canadian-born comedian Howie Mandel. The new owners, which include U.S. talent agency ICM Partners, said the company will continue normal operations, with the same leadership in place. Mandel says he has always been a big fan of the annual Montreal comedy festival and performed many times over the last decade. “Nothing feels like coming home more than being part of the Just For Laughs,” he said from Los Angeles. Just For Laughs was rocked last fall after several women came forward with allegations of sexual assault and sexual harassment against its founder and majority stakeholder, Gilbert Rozon. Rozon, who stepped down as president in October, said he would sell his shares in the Just For Laughs company in response to the allegations, which he has denied and have not been proven in court. Financial terms of the deal announced Wednesday were not divulged. Mandel said he hopes he can be a strong voice promoting it to comedians around the world. “I just want to be loud and entertaining and get the message out that if you want to be anything of any value in comedy you have to come to Montreal,” he added. Comedy observers said they were worried when ICM’s name surfaced as a potential buyer a few weeks ago. Mark Breslin, co-founder of the Yuk Yuk’s comedy clubs, said Mandel’s involvement mitigates those worries. But Karl Moore, a management professor at McGill University’s Desautels Faculty of Management, said it’s unfortunate that another successful Quebec company has resorted to foreign ownership. “We’ve lost some big companies in Montreal to the U.S. and elsewhere and it’s a bit disappointing from the viewpoint that Montreal and Canada can’t maintain those kinds of companies,” he said, pointing to Alcan, Cirque du Soleil and Bombardier’s C Series program. In addition to the comedy festival in Montreal started in 1983, Just For Laughs produces international comedy tours, television specials and annual festivals around the world including in Toronto, Vancouver and Sydney, Australia. It has production and distribution businesses in more than 135 countries and its programming is seen on more than 100 airlines. Festival chairman Pierre-Marc Johnson said the strategic alliance with Mandel and ICM ensures it has the resources to thrive and removes uncertainties about its future. He also welcomed the commitment to maintain two festivals in Canada’s two official languages. The new owners also said they are in talks with prominent unnamed local Quebec players to join the investment group. Mandel said he hopes French-language comedians who have distanced themselves from the festival will return since he admires their work and says it’s vital to have a French component. Media giant Quebecor Inc. said last week that it would not exercise its right of first refusal in the sale of Just for Laughs. It had claimed the company could not be sold without its consent and filed a request for an injunction in Quebec Superior Court, demanding its 2012 partnership deal with the comedy festival be respected. On Monday, its cable subsidiary Videotron announced it is becoming a partner of a new Montreal comedy festival that will be launched this summer over the two weeks preceding Just For Laughs.